← Is warmer air ‘heavier’? Does lightning add nitrogen to the soil? 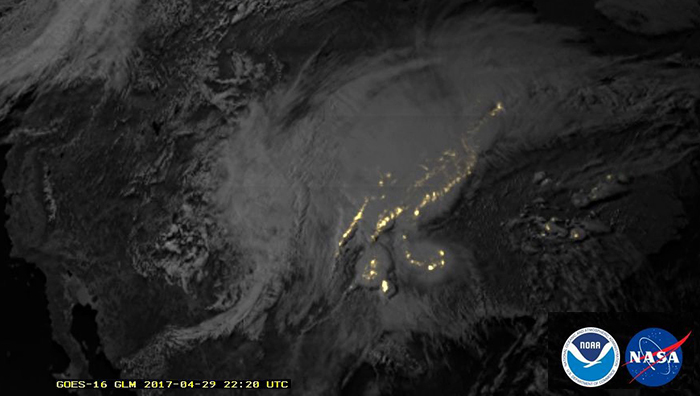 Lightning mapped by the GOES-16 satellite in April 2017. Each lightning bolt carries electrical energy powerful enough to break atmospheric nitrogen bonds. Yes, lightning adds nitrogen to soil, but not directly. The atmosphere’s composition is 78 percent nitrogen, but the nitrogen in the air is not available to our bodies. The two atoms in the airborne nitrogen molecule are held together very tightly. For our bodies to process that nitrogen, the two atoms must separated. Our bodies need proteins that contain nitrogen. The way our bodies normally get nitrogen is by eating plants or animals that eat plants. Plants absorb nitrates in the soil and when we eat plants, we get the nitrogen in a form that our bodies can use. Plants also cannot make use of the nitrogen in the atmosphere so fertilizer is one way to add nitrogen to the soil. Lightning is another natural way. 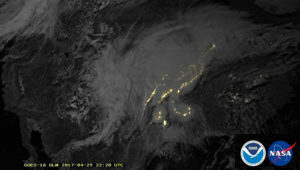 Nitrogen in the atmosphere can be transformed into a plant-usable form, a process called nitrogen fixation, by lightning. Each bolt of lightning carries electrical energy that is powerful enough to break the strong bonds of the nitrogen molecule in the atmosphere. Once split, the nitrogen atoms quickly bond to oxygen in the atmosphere, forming nitrogen dioxide. Along with the lightning in the cloud are cloud droplets and raindrops. Nitrogen dioxide dissolves in water, creating nitric acid, which forms nitrates. The nitrates fall to the ground in raindrops and seep into the soil in a form that can be absorbed by plants. Lightning does add nitrogen to the soil, as nitrates dissolve in precipitation. This helps plants, but microorganisms in the soil do the vast majority of nitrogen fixation. Steve Ackerman and Jonathan Martin, the ‘Weather Guys’, are professors in the UW-Madison department of Atmospheric and Oceanic Sciences, and guests on WHA radio (970 AM) at 11:45 a.m. the last Monday of each month. Comments Off on Does lightning add nitrogen to the soil?